Sen. Elizabeth Warren, known better in many circles as “Fauxcahontas," has received a very thoughtful birthday gift by her Massachusetts challenger: a DNA test. 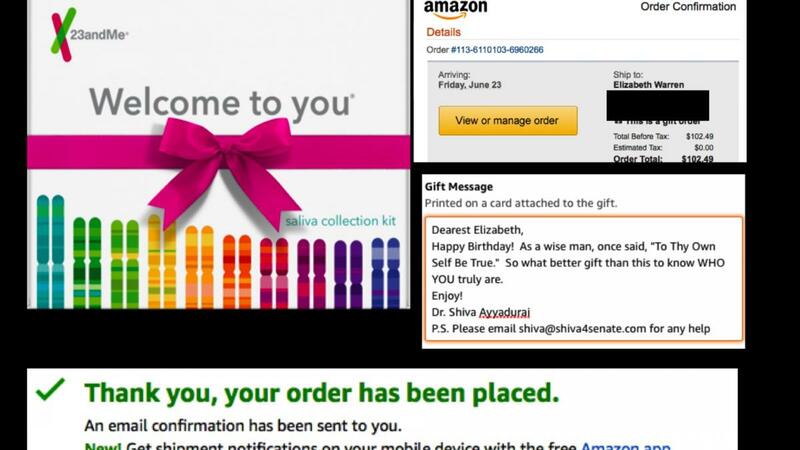 In a hilarious gesture, Shiva Ayyadurai, a Republican running for Warren's senate seat, sent Ms. Warren a 23andme DNA test kit as a birthday present. Fox News reported on Monday that Ayyadurai had tweeted about sending the Massachusetts senator, whose birthday was on June 22, a DNA test as a birthday present, along with an affectionate note. "Dearest Elizabeth, Happy Birthday! As a wise man once said, 'To Thy Own Self Be True.' So what better gift than this to know WHO YOU truly are. Enjoy!" Dr. Ayyadurai also included his email, just in case the senator needs any help. Elizabeth Warren has claimed that she has Native American ancestry, though there seems to be little proof to back that up. She did once, however, contribute to a Native American cookbook called Pow Wow Chow, and has even autographed items as "Elizabeth Warren-Cherokee." The well-meaning gesture apparently was not well received, as Warren refused the gift. Ayyadurai later tweeted that he was receiving a refund from Amazon, because the senator never actually got it. Maybe next year, just send her a gift card to Moccasins 'R Us.